Hailing from the Italian fishing village of Chioggia, this heirloom radicchio forms large, firm round heads of lovely variegated leaves in pure white and rosy red. This rarely encountered variety imparts radicchio's signature sparky, bittersweet flavor. 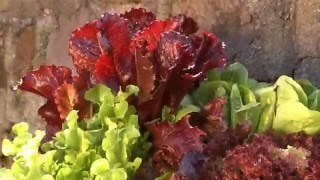 Sow radicchio in early spring 2-3 weeks before the last frost and again in midsummer for a fall harvest. In rows 12 inches apart, sow seeds evenly and cover with ¼ inch of fine soil. Firm lightly and water gently. Thin gradually to stand 12 inches apart starting when seedlings are about 3 inches high. New growth in cool weather produces the small, red, cabbage-like heads. For mid-summer plantings, cut off all leaves above the crown in early fall. Keep weeds under control during the radicchio growing season. Weeds compete with vegetable plants for water, space and nutrients, so control them by either cultivating often or use a mulch to prevent their seeds from germinating. Avoid disturbing the soil around the plants when weeding as radicchio is shallow rooted. Monitor radicchio for pests and diseases. Check with your local Cooperative Extension Service for pest controls recommended for your area. Harvest individual leaves any time. Harvest heads when they are firm to touch, usually 60-65 days after sowing. 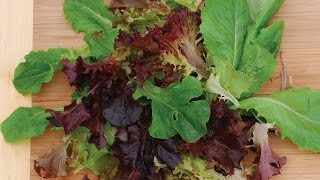 Radicchio makes a great lettuce substitute in salads. Leaves can be sautéed or steamed as well as eaten raw. The older the head the more bitter the flavor. After a frost, harvest the head, remove and discard any leaves that are frozen on the outside. Store in a perforated plastic bag in the refrigerator for up to 3-4 weeks. Radicchio, Variegated Chioggia is rated 3.0 out of 5 by 1.